Skoda Superb, a Volkswagen group's product has been on the market for about three years and is considered as a huge sales puller due to its distinctive and captivate design and efficient engine, but all was due in its family is its face lift version, well no more wait for this too. as per details the Czech automaker is going to launch 2012 Skoda superb that would be the face lift version of flagship model Skoda Superb. The all new car was captured when it was on test run. 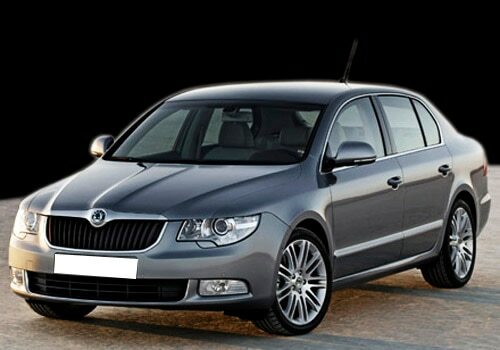 As the name suggest, the Skoda Superb facelifted is likely to be launched in 2012. No information regarding Skoda Superb price has been received yet the price might be tagged in the range of Rs 18 lakh -26 lakh. According to spy shots the 2012 Skoda superb carry minor changes inclusive of both interiors and exteriors. New style on both front and rear of the car and day time running light are likely to be major new changes in the face lifted Skoda superb. the highlights are visible in the spy shots, but front grille seems to be little flatter. additionally newly designed bumper and chrome finishing on a number of places are other cosmetic changes in the car. The front and rear lights are completely veiled so new headlights and new taillight clusters can be expected. apart from this aerodynamics of car also expected to be enhanced for better efficiency. The car is proposed to be offered with both diesel and petrol engine option same as the current cars of group running on. the petrol engine is likely to be a 1.8 L 140 Bhp engine along with a 3.6 L 260 bhp engine option,While the diesel variant of the car is hoped to house a 2L 140 Bhp TDI engine. If talk about safety features the car is coupled with latest safety features. ABS avoids wheels locking in hard braking. Well not only in automobiles , but Skoda has a lot of concern for digging up artistic quality of people in the country, and for this the company organized a solo dance contest last year. Among the 128 entries from all over country 20 finalist were selected ,who will be offered an opportunity to perform their Indian contemporary art. Well Skoda Superb review suggest that with a perfect blend of indifferent design, lavish luxury, excellent performance and uncompromised safety, Superb will be the best among all in the class in all perceptions.